Today’s St Patrick’s Day and naturally, my thoughts turn to the Irish. The Irish are known for their very meaningful blessings. But I also think of all the blessings I’ve received from them. Thanks to my extended family having many Irish friends – mainly priests and nuns who made India their home – and then my Aunt Leila bringing in a lot of Irish literature and music in to our home. So with books it was Catherine Cookson for me then and Cecelia Ahern now. I loved the very real characters and the stories of good triumphing in the harsh and poor conditions that were a part of Catherine Cookson’s writing. And now I love the crazy fantasy of Cecelia Ahern. Somehow both authors manage to make me laugh and cry. As a child I heard the crazy songs of Val Doonican and its the beautiful soul stirring songs of Celtic Woman and Celtic Thunder now. If you give the loan of your britches, don’t cut off the buttons. And here’s one that shows the typical humor of the Irish. 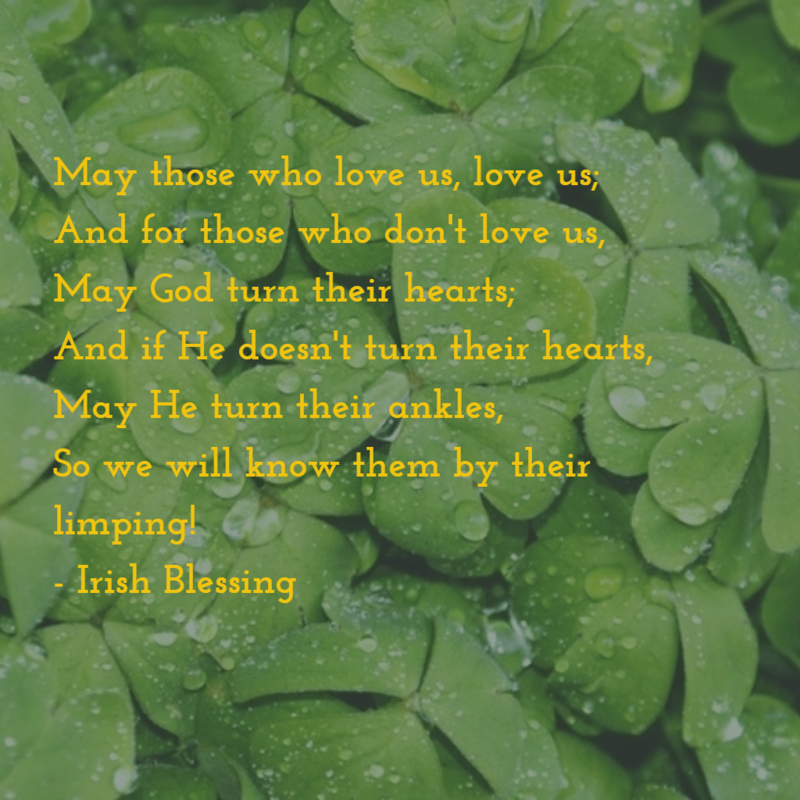 Enjoyed this post and the Irish blessings. I am going to give you a shoutout Sunday on my weekly blog roundup! Oh man.. these were hilarious!! I especially loved the last blessing… and the wisdom analogy to hair… thanks for sharing Lady! Oh yes they are. Ireland is on my someday-soon list! I think you hit the nail on the head with your analysis of their sayings – there is a pleasantly smug self-awareness to it all. Their true nature is so easily visible in those words, whether it be whimsy or their religious roots. Surprisingly, one of my fav Irish authors has very little of this in his own prose- John Connolly is a crime thriller writer who writes truly atmospheric psychological thrillers with nary a moment to smile or pause. Yes, I think they have such a wonderful mix of the magic they believe in – four leaf clovers, leprechauns, etc and their deep rooted Christian faith. I haven’t read Connolly, but I’d recommend a totally different author to you – Frank McCourt. No doubt his book Angela’s Ashes is a memoir, but riveting all the same. He won a Pulitzer for it. @ Doli – Nice. Which one was that…I love the one that goes..May the road rise to meet you…. @ Damien – You're very welcome – it was heartfelt. @ Sally – like that too. Maeve Binchy, I like – but I find too few books of hers. Her's one of my favorites..
And live each day as if it were your last. Maeve Binchy,my favorite author to read when I am on holiday,another Irish lovely!! That is great. Thanks so much for the sentiments! Erin go Bragh!